Looking for Marrakech Mint Loose Tea? We've blended our smoky Gunpowder Green with pure peppermint leaves, inspired by the tea served in the souks of the Moroccan medina. We've added a sprinkling of blue cornflower petals for a bit of a British touch. Fired and rolled 'gunpowder' style green tea was one of the first teas the Chinese traded with the Arabs. It's since become particularly prevalent in North Africa, where the tea is traditionally blended with mint and served strong with heaps of sugar. You might like to enjoy our Marrakech Mint in the traditional style with honey or sugar, but we'd suggest brewing lightly to appreciate its nuanced flavour - it's a surprisingly refreshing way to cool off after a hard day's haggling. 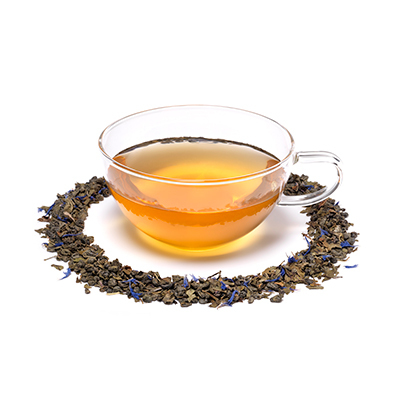 Loose Leaf Tea - Green Tea, 10% Peppermint, Cornflower Petals, Flavouring. Teabags - 80% Green Tea, 20% Peppermint.